In many deployments we do as consultants, our customers may not have all of the pieces of the puzzle that we need to finish our project. One of those missing pieces is frequently a RADIUS/TACACS+ server. We’ll skip the RADIUS vs. TACACS+ discussion for now, and assume we’re setting up a Microsoft Server with the NPS role. Since a lot of customers are a Microsoft shop already, and NPS is part of the OS, the customer doesn’t have to shell out the cash for Cisco ACS. One of the things that I would always find annoying (but not annoying enough to spend the time to research – until now of course) is that you had to specify each RADIUS client that you wanted to authenticate. When there’s 5 or 10 devices, that’s not a big deal, but when you have hundreds of devices, it gets old quickly. Here’s a way (I’m sure there are others, but this is how I solved the issue), to use NPS to authenticate any number of devices without having to manually specify each client individually. We’ll assume that you have already added the NPS role to the server. 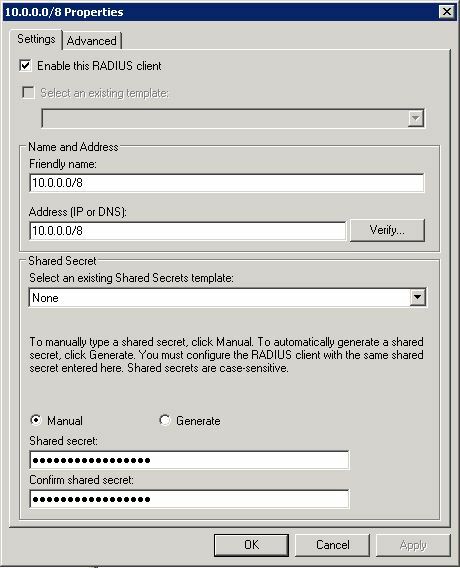 (If not, click here) The first step is to add a RADIUS client. In our case, we’ll be adding subnets instead of a specific client IP. Adding a specific subnet works well if your customer has a dedicated management vlan or a consistent addressing scheme, but this customer did not, so we had to include all of the RFC 1918 address space. Add a condition: Scroll down about halfway and add “Client IPv4 Address” – here’s the import part…in the address field, specify *.*.*. * which is the wildcard for any IPv4 address. Accept the defaults for the rest of the wizard. 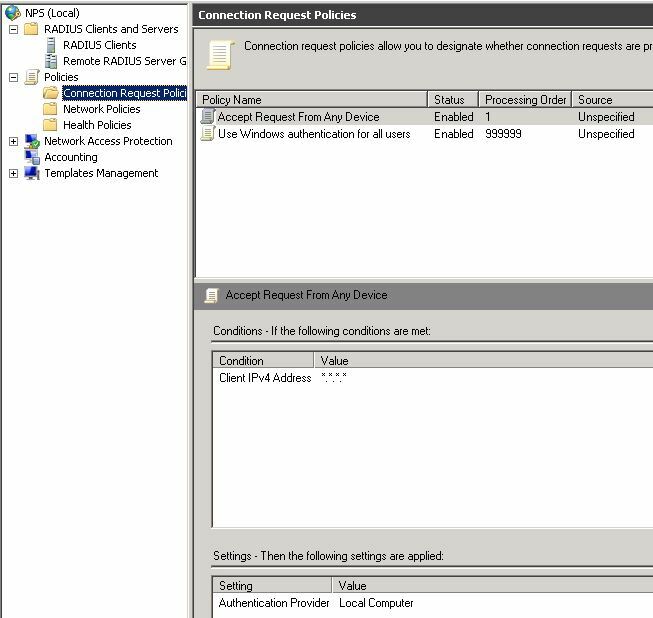 Type of access server – leave as unspecified. Click Next. Add a condition: Windows Groups – then choose the AD group where your admin user accounts live. Click Next. Accept the defaults for the rest of the prompts. So now we have created a configuration that will authenticate any network device (that has the correct shared secret, of course) against an AD group of your choosing. In our case, any AD user that was in the group had access to the devices. We didn’t differentiate between privilege levels or anything like that.